One of the principal advantages the Rankine cycle holds over others is that during the compression stage relatively little work is required to drive the pump, the working fluid being in its liquid phase at this point. By condensing the fluid, the work required by the pump consumes only 1% to 3% of the turbine (or reciprocating engine) power and contributes to a much higher efficiency for a real cycle. The benefit of this is lost somewhat due to the lower heat addition temperature. 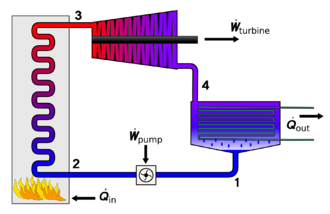 Gas turbines, for instance, have turbine entry temperatures approaching 1500 °C. Nonetheless, the efficiencies of actual large steam cycles and large modern simple cycle gas turbines are fairly well matched. 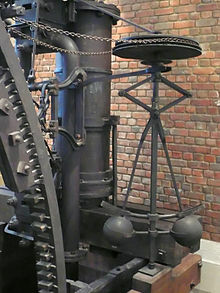 In practice, a reciprocating steam engine cycle exhausting the steam to atmosphere will typically have an efficiency (including the boiler) in the range of 1–10%, but with the addition of a condenser, Corliss valves, multiple expansion, and high steam pressure / temperature, it may be greatly improved, historically into the regime of 10–20%, and very rarely slightly higher. 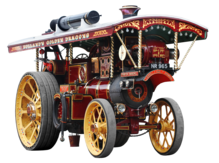 ^ "University of Rochester, NY, The growth of the steam engine online history resource, chapter one". History.rochester.edu. Retrieved 2010-02-03. 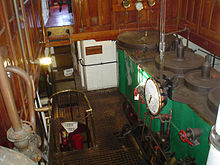 ^ "Nation Park Service Steam Locomotive article with photo of Fitch Steam model and dates of construction as 1780–1790". Nps.gov. 2002-02-14. Retrieved 2009-11-03. 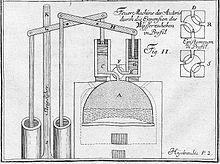 ^ "Fossil Energy: How Turbine Power Plants Work". Fossil.energy.gov. Archived from the original on 12 August 2011. Retrieved 2011-09-25. ^ "Power Engineering and PEI Magazines: Daily coverage of electric power generation technology, fuels, transmission, equipment, coal power plants, renewable energy sources, emission control, more – Power-Gen Worldwide". Pepei.pennnet.com. Retrieved 2010-02-03.